Book your backcountry trip now by calling (606) 364-2021. Are you looking for the ultimate horseback riding adventure? Allow us to take you on a backcountry pack trip in the Daniel Boone National Forest. 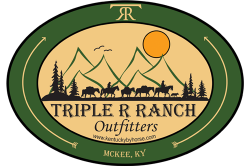 As far as we know, we are the only outfitter in Kentucky that offers backcountry horseback riding pack trips. Take a pack trip with us and experience the wild in a primitive setting. This option is not for the faint of heart, but if you are looking for an adventure that will bring you closer to nature, this is definitely an experience like no other. We will provide the supplies and gear you need for the duration of the ride. All you need to bring is personal gear and sleeping bag. Check out the articles below if you have never been on a backcountry trip to get an idea of what you might need. When you book a Montana-style backcountry horse pack trip with us, we will take you on the horseback riding adventure of a lifetime. Let our friendly wranglers worry about transporting your gear and setting up camp while you enjoy the great outdoors. You will encounter many great photo opportunities and learn about the biological diversity and history of the area. If you don't have your own horse, you can ride a Triple R Ranch horse. We have a variety of breeds for you to choose from, including gaited horses and quarter horses. Please call us at (606) 364-2021 to book your trip. Price is per night per person and includes meals, wrangler, pack gear, and camping equipment. At this time, we can accommodate groups of 2-4. Triple R Ranch operates on a leave no trace policy so future generations will get to enjoy the forest for years to come.